Peacefully located amidst the picture-perfect rolling countryside, Villa Kvinta presents a perfect base from which to explore all the delights of one of Istrian most wonderful regions. Thoughtfully designed with a blend of traditional and modern style, this pretty villa offers a neutral, airy interior, with all the modern amenities you could need from free WiFi, air-conditioning throughout, as well as underfloor heating to DVD player and Playstation to keep the children amused. There is also a Finish sauna at your disposal for some extra relaxation. Three of the double bedrooms are on the upper floor with beautiful views over the garden and the surrounding countryside. A further double bedroom is located on the ground floor with direct access to the garden, providing convenience if there are less mobile members in your party. Three of the bedrooms have their own private bathrooms, and each one the added benefit of a flat screen TV. The open plan ground floor features a cosy lounge area and a fully equipped kitchen, both with large sliding doors leading onto the pool area outside. A dining suite in the kitchen is just one option for mealtimes, although by far the most popular will be the covered outside dining area with a built-in barbecue, ideal for making the most of the wonderful Mediterranean climate here. The lovely completely walled garden and the inviting private pool will be where you will likely spend most of your holiday, just chilling out and enjoying the sunshine. However, should you ever want to leave the comforts of your holiday villa, there are some of the Istrian most beautiful beaches along this stretch of the coastline just 12 km from the villa, as is a handful of local bars and restaurants. 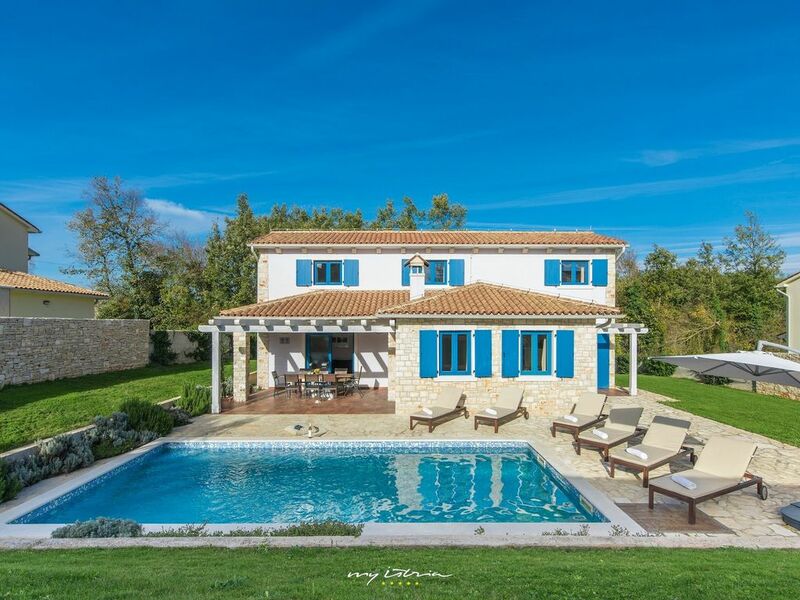 Villa Kvinta is situated within an exclusive development called Villas Adagio with further eight equally charming villas designed to make your holiday experience an unforgettable one. Its idyllic, natural setting is perfect for those who want to escape the crowds and are looking for a more authentic holiday experience. The amazing medieval little towns of Barban, Svetvincenat and Zminj offer a rich historical and cultural heritage within the narrow, winding streets, as well as all the necessary amenities. The more active visitors will enjoy in the nearby adrenaline park and the beautiful horse ranch, while the foodies will appreciate the excellent offer of local delicacies served in the many restaurants, agro-tourisms and local cellars in the area. There are plenty of opportunities for walking and cycling as well, while the famous towns of Pula, Rovinj and Opatija can be easily reached along excellent roads for more diverse shopping, eating and entertainment options.